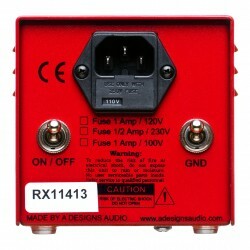 The REDDI is a fire-engine red tube direct box with an unquestionable quality of sound. We feel this is our best foot forward in giving the audio world a truly remarkable product at an affordable price. Inspired by the glorious sound of the classic “flip-top” tube bass amp, REDDI’s 6N1-P tube-driven amplifier feeds signal directly into a hefty custom output transformer by Cinemag – a key component to providing a harmonically rich tone. The REDDI’s all-tube circuitry will enhance the character of any electrified instrument run through it – not just bass! The REDDI has been field tested and referred by recording engineers to be the “best tube DI ever made”. With wider bandwidth and just the right amount of gain, the REDDI stands clear and clean above the competition. The REDDI can be Rack Mounted for use with 2 or more units. 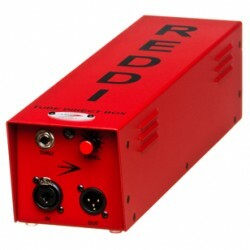 Great for Basses, Guitars, Synths and electronic instruments that require a direct box for recording, the REDDI is READY to give you unsurpassed sound for that perfect recording or live performance. A Designs believes REDDI will set the NEW benchmark for tube direct boxes!